Not All Who Wander Are Lost: Light on the horizon! I was on my way to the waste water treatment plant just after lunch to fix a printer problem when I saw something I haven't seen for a long time - orange light on the horizon. The sun is coming back! It is just in time too. Our abnormally mild winter weather has finally taken a turn for the worse. -26F was the high I saw today. This past weekend it was even colder. Unfortunately, we won't really feel the warmth of the sun until it rises in late August. 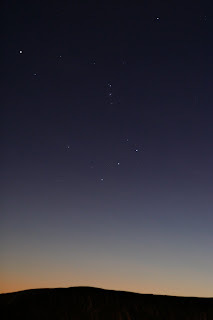 Orion over the rising sun, though we won't see the sun for another six weeks (ISO 800, F/3.5, 2 sec). If you look closely, you'll see the three stars of Orion's belt. The brightest star in the picture (top left corner) is Orion's foot. It is Rigel. Down here, Orion is upside down from what I'm used to seeing in the Northern hemisphere. I like to think that the constellation is really named Achilles and his mother his dunking him in the Ross Sea. I never knew you see the constellations upside down! Cool! We saw lots of stars this past weekend while camping in the mountains. The sky was crystal clear! It was a treat because the Sacramento Valley is now covered in smoke & ashes from the surrounding fires. As soon as we descended from the mountains, our views of the valley spanned only about 30 feet. So sad.